Do you suffer from cracked or fractured teeth, decaying teeth, fractured or large fillings or are you just looking to improve your smile? If you answered yes to any of these, then dental crowns are a GREAT option for making a less-than-perfect smile close to perfect! A dental crown is a tooth-shaped “cap” that is placed over a tooth. It covers the tooth and restores its shape, size, strength and appearance. Once cemented in place it will completely cover the visible portion of a tooth above the gum line. Generally speaking, the main advantage of placing a crown are that it looks and feels a lot better. One of the biggest challenges with dental crowns however, is the fact that traditionally it has required at least two separate visits to complete the process. The first visit to create a mold or impression of your tooth so a custom crown can then be created offsite by a dental lab that specializes in creating dental crowns. The second visit is when this custom crown is placed to complete the process. In reality though, do you really have the time (or patience!) to space out the restorative dental work you need? Introducing – Dental Crowns In A Day! Thanks to something called CEREC (the short name for Chairside Economical Restoration of Esthetic Ceramics), you no long have to spread out the process over several appointments as it is now possible to complete the entire dental crown process in one single visit! They look, feel and function like a regular tooth so you (and everyone around you) won’t even know you have a dental crown. CEREC crowns don’t impact the existing, healthy tooth structure. They are permanently attached so no more dealing with uncomfortable temporaries or messy adhesives. In addition to looking all natural, these dental crowns are durable and are not prone to cracks and flaws like other types of restorations. 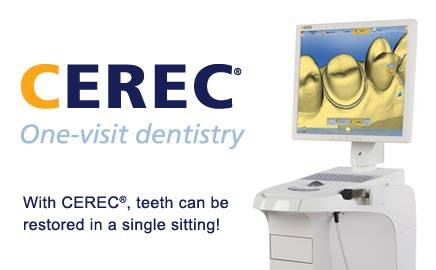 CEREC crowns are milled from a single block of high-quality ceramic and has the same characteristics as tooth enamel. Plus, the equipment is on-site so any necessary adjustments can be made immediately. They are designed to expand and contract naturally based on hot or cold temperatures so no more problems with sensitive teeth. Get your new smile today! You save valuable time because it’s all done in one visit so no more missing work or using up valuable vacation time! CEREC technology has literally transformed modern dentistry. Our guests can have complex restorative dental care completed in just one day, even within a couple of hours; versus having the same procedure spread out over long periods of time, or several appointments. Contact Us today to learn more about CEREC Crowns-In-A-Day and how they can benefit and improve your smile.